White sharks are a real concern for surfers, especially those who surf the North West coast of the United States and South Africa. 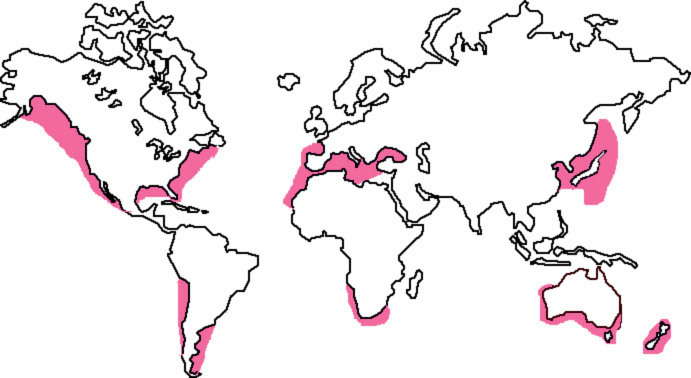 the truth is though, Great White sharks can be found off the coast of all major continents as shown in the map below. Great White sharks are responsible for attacking and even killing surfers in California, Oregon, Canada and Africa but there are ways to lower the chances and fend them off if it does happen. The area between Santa Cruz, San Francisco and the Farallon Islands in California (known as the Blood Triangle) swells with Great White Sharks each year around winter time as they visit to breed. Unfortunately, that’s exactly when some of the best waves are, the winter swell provides size and consistency and that’s exactly what sets off competitions like Mavericks in Half Moon Bay. Over the years as I’ve surfed in Northern California I have picked up a few tips and tricks for avoiding and defending against sharks. This is not legal advice, just tips and tricks I’ve heard from friends, learned from Shark Week on Discover Channel and picked up from spear fishermen (who are also targeted by sharks in these regions). Feel free to share your own tips below in the comments, it doesn’t happen often but nobody wants to lose an arm or leg or disrupt this amazing super-predator. Surf with at least one friend, paddle out together, have a plan in mind for if something goes wrong, do both of you have cell phones? Do both of you have access to the car? Do your friends and family know where you are? Do you know how to treat for shock and tie a tourniquet if a limb is taken? Most of the time when White Sharks hit a person they will take a bite, shake a little and then leave, the shark won’t eat the person just probe them, so shock and loss of blood is the real killer. If it is raining or just rained consider getting out, rain washes nutrients from the land into the ocean and smaller fish and seals come to feed, this in turn attracts larger predators like White Sharks. In crowded areas like Ocean Beach in San Francisco the rain also washes oil and other pollution into the water which can make you sick. As a final precaution consider purchasing an electric surf leash by Shark Shield, these were created with skin divers in mind. Spear fishers are at high risk with sharks, higher than surfers, because they are actually causing sea creatures to bleed as they spear them which attracts sharks. Just like when a seal eats a fish and makes it bleed and a shark targets the seal, spear fishermen get targeted as part of the food chain. So an electronic device was developed for them that deters sharks at the last moment of attack. As White Sharks close in on prey they use smell for blood then vision as they get closer and finally sonar (like dolphins) as they close their eyes at the last moment of attack. The Shark Shield is designed to create an electronic boundary tha twill disrupt thats shark’s sonar and irritate the shark, possibly saving your life. 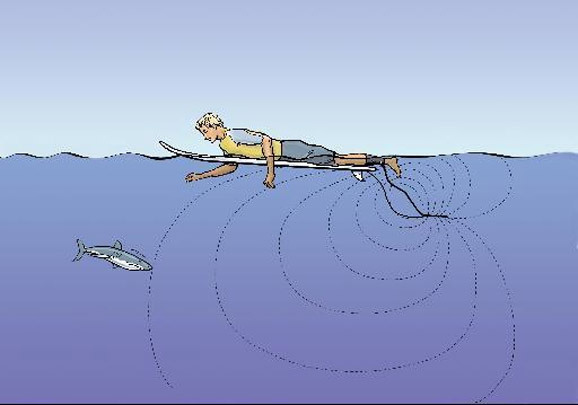 Shark Shield now comes in a surfer specific model illustrated below that can be used as a leash in place of a regular non-electrified leash. 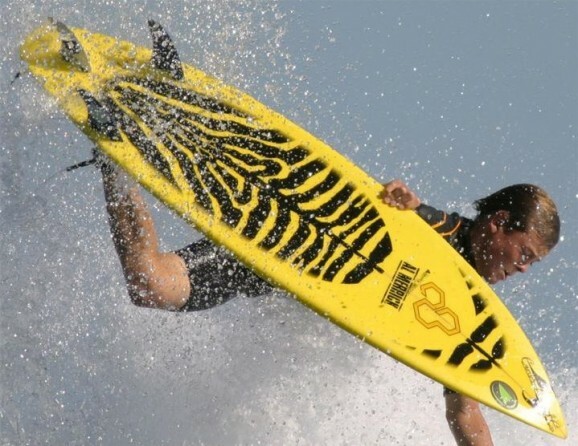 I owned one of these and it worked pretty well, though it did spook some of the surfers I was with and it was expensive, who knows if it scared any sharks away? It made me feel more comfortable when surfing alone and way out. If you are hit by a White Shark I’ve been told to fight back by punching the nose and poking the eyes, these are vulnerable spots and the shark might let you go but you will probably still suffer some damage. Stay calm and try to paddle back, call for help, keep swimming as the shark may return as it senses your blood. Good luck out there and be safe. This entry was posted on Monday, June 21st, 2010 at 6:30 am.